Jake Farrell attempts to recruit his brother-in-law to head up the new Youngblood but SuperPatriot is not at all interested. He points out that he has already led a government super-team back in the 1960s with the Liberty League and that did not end well. SuperPatriot is now in his mid-70s and suggests that the government looks for a younger man to fulfil the role. The career of She-Dragon as part of the Chicago Police Department is not going at all well and she is defeated by her former teammate Super-X. As her colleagues are cornered by the villain Dragon arrives on the scene and takes Super-X down. He gathers up the unconscious super-freak and heads off to claim the bounty on him, letting the police know to call him should they get any more trouble. Horde is displeased with Dragon’s spirit not being broken despite being removed from the police force and is frustrated that he remains a thorn in the side of the Vicious Circle. Captain Mendosa is blamed for this but the corrupt police official refuses to accept any blame. He points out that he succeeded in his assignment to fire Dragon and that it is Horde that is failing. It is suggested that as Horde commands an army of villains then perhaps he should unleash them upon their mutual enemy. After eighteen years of incarceration, Ralph Jonson is just days away from completing his sentence and getting released. He is visited in prison by his brother William who has come hoping for assurances that his sibling does not bear a grudge against him for giving evidence against Ralph for murdering their parents. Ralph refuses to give such a promise and declares that he very much still holds a grudge against his younger brother and wishes him dead. Alex Wilde catches up with her former partner as Dragon is helping with the clean-up efforts in Chicago. He has found all kinds of stuff as he has worked through the debris and is coping quite well with adjusting to life outside of the police. Their conversation is ended as Gateway opens a portal and a few dozen members of the Vicious Circle emerge. They begin an assault to finally eliminate Dragon but their intended target picks up a Martian shrinking gun and fires the weapon. His assailants are reduced to a miniaturised state and flee into the sewers. Dragon destroys the gun as a representative from the government named Stephenson approaches Dragon about leading the new Youngblood. Having recently fled the leech-possessed Vicious Circle, PowerHouse agrees to a meeting with Octopus in a hidden laboratory. The pair shares the view that Horde has no record with the Vicious Circle and should therefore not be leading them. Octopus has been working on a way to help them remove Horde from power and reveals that he succeeded in saving CyberFace’s life. He has attached the villain’s head to the ape body of BrainiApe and they are close to challenging for leadership. Dragon declares that he has no desire to lead a team called Youngblood and requests that Stephenson retire the name. 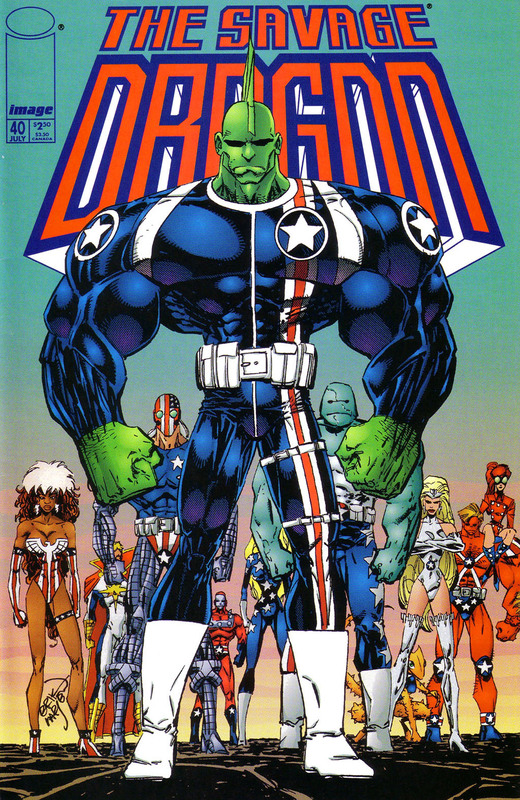 He is granted permission to choose his own team with the knowledge that there were other heroes currently training for positions in Youngblood that could join the new team. Dragon is then entered into six days of meetings before telling another official, Hawkins, he has no desire for his new group to be merchandised or act as celebrities like their predecessors did. The Freak Force team are the first to be invited to join the new team and Barbaric is excited over the prospect of replacing Badrock as the next Badrock. Mighty Man announces that he cannot possibly join as it would mean relocating to Washington, DC and giving up his secret identity. Rapture is keen to sign up even if no one else does. Dart has concerns considering they recently did something similar by going to work for Peter Klaptin but Dragon points out that they can always quit if it does not work out. Dragon then stops by an abandoned church where the Underground Freaks have recently moved to and announces that he would like many of them to join him. Chris Robinson is asked to quit the Chicago Police Department and join as Star, becoming a legitimate superhero. He does not wish to mess up his relationship with Alex Wilde and reluctantly turns the position down. Kill-Cat is thrilled at the opportunity to work in the new Youngblood but Dragon is quick to point out that he does not want him, only the Kid Avenger. Kill-Cat is dismissed as an idiot and although the Kid Avenger is not much better, Dragon believes that can be turned around with some decent training. Stepehenson and Hawkins arrive to collect up the members of their new super-team as one final addition, Jennifer Murphy, arrives to round out the roster of the Special Operations Strikeforce.